Carol’s books highlight the healing power of relationship and how elephants, humans and dogs can bring great joy to each other. 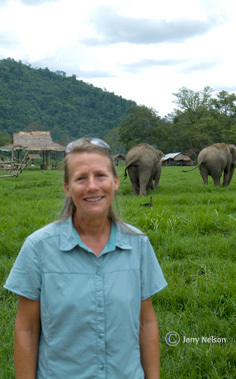 The revenue generated from the sale of these books supports Carol’s continuing work to help needy elephants. All prices including shipping and handling. Please allow 7 to 14 business days for your order to be processed before mailing. 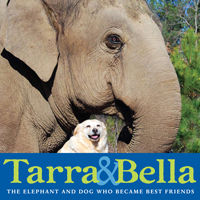 *Price includes $7 S & H.
In January 2009, the story about the unique and enduring friendship between The Elephant Sanctuary inspiration and first resident Tarra, a 35-year-old Asian elephant and Bella, a rescued mixed-breed dog, became a media sensation around the world. The story of these two Sanctuary best friends was first broadcast on CBS News, and then featured on newscasts, and internet sites around the world. In Carol Buckley's third picture book, she tells the story of how these two very different animals formed an unlikely yet indelible bond. Readers of all ages will find Tarra and Bella to be truly an inspiration to us all. *Prices includes $7 S & H.
Shirley, an elderly former circus elephant who had suffered a debilitating leg injury that forced her retirement, lived alone at a small Louisiana zoo for twenty-three years. When the zoo decided Shirley needed to live with other elephants, she moved to The Elephant Sanctuary in Tennessee, the nation’s first natural habitat refuge for old and sick elephants. On her first day at the Sanctuary, Shirley is welcomed by the other elephants and has an emotional reunion with Jenny, a younger elephant with whom she worked in the circus two decades before. Shirley will never be alone again and, together, she and Jenny begin a new life. A Smithsonian "Notable Books for Children" (2006) and winner of the National Association for Humane and Environmental Education’s KIND Children's Book Award. They met when Carol Buckley was a college student studying the care of exotic animals and Tarra was the tiny mascot for a tire company. Carol soon took over Tarra’s care and eventually she was able to buy the young elephant. Together they toured the U.S. and Canada performing with various circuses and theme parks and Tarra won fame as the world’s only roller skating elephant. But after fifteen years of traveling and performing, Carol knew it was time for Tarra to retire and live as natural an elephant life as possible. 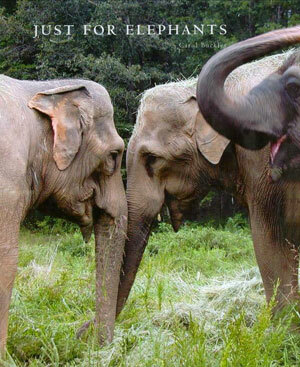 This led her to buy land in rural Tennessee, and Tarra became the first resident of The Elephant Sanctuary. 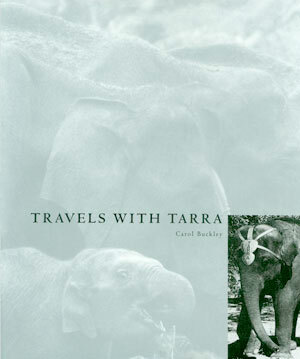 This set includes Travels with Tarra, Just for Elephants and Tarra & Bella. *Prices includes $11 S & H.